As reported by GGW, it appears as if the proposal to bring cycletracks to M St. (and L St.) is on hold, if not dead. This is bad for Georgetown. A cycletrack is a special bike lane where parking spots are moved away from the curb and a two way bike path is put there instead. 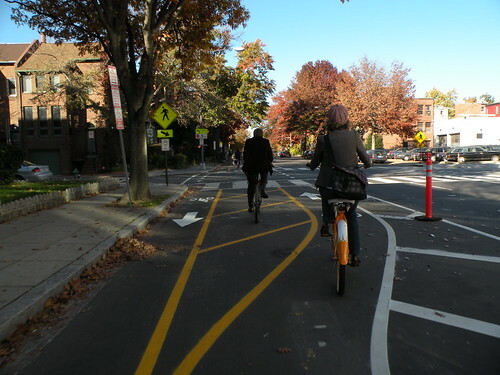 There is a very successful cycletrack on 15th St. from Pennsylvania Ave. all the way up past U St.
Cycltracks are a great way to give bikers a safe and comfortable ride on city streets. GM takes the 15th st. cycletrack home from work frequently, even though it is somewhat out of his way. And installation on a street like 15th St. has little effect on car traffic since the street was not congested prior to installation. DDOT has had plans on the books to bring crosstown lanes to compliment this north-south route. The most recent plans called for installation of the lanes on L and M Streets from the Mt. Vernon Square area all the way to Georgetown (or Foggy Bottom in the case of L St.) This would hugely benefit Georgetowners as it would provide a quick and safe bike route to and from home. Plus, the ANC is strongly pushing for the installation of a bikeshare station at the south end of Rose Park, which would be right at the west end of the M St. Ultimately, GM would like to see the cycletrack brought all the way through Georgetown, but getting it to the doorstep would be a good first step. This is a bad start for Bellamy and his boss, Mayor Gray. Surely there are larger issues facing DDOT and the Mayor, but that is no reason to shelve a very worthy project like this. If you agree with GM, add your name to this WABA petition. Read more The Georgetown Metropolitan here.